My husband and I enjoy a good hike, especially this time of year, before the heat of the summer. One of our favorite things to do is to watch all the wildflowers grow and bloom. While Florida's main wildflower season is usually in the fall, the spring also brings a bunch of beautiful blossoms. One, in particular, always stands out to me (possibly because my favorite color is purple) and that's the Violet. There are over 550 species of Violet world-wide, and we have about 10 here in Florida. All of them have similar medicinal and edible qualities, so they're all pretty much interchangeable. 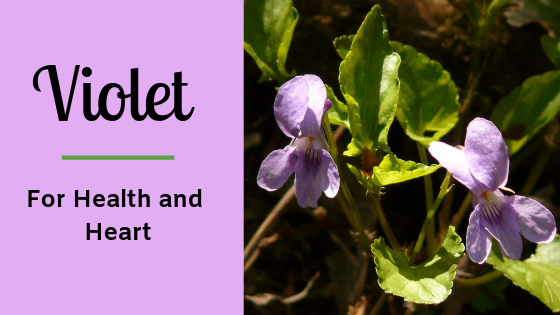 The most common one you'll find in North America, and especially here in the South East region of the US, is the Common Violet, or Viola sororia. This little flower is a light blueish purple color with heart shaped leaves. However the super fascinating bit about this plant is the other flowers that develop below ground. These subterranean blooms are the part of the plant that actually produce the seeds and only emerge from the ground when they're ready to spread those seeds. Some people refer to these flowers as “Plan B” flowers, which fairly accurate. If you were a plant who's leaves and flowers were so pretty that every little girl wants to pick them all, or so tasty that every passing animal wants to eat them all, wouldn't you want a different method of propagation for yourself? A “Plan B” so to speak? 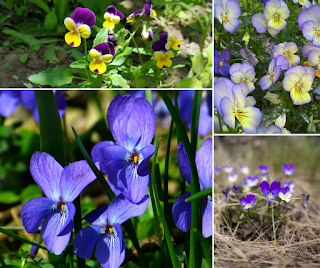 Here are some examples of what different Violets may look like. I have finally done it! I've made a video! And guess what... it's on VIOLETS! Check it out here and please follow, subscribe, like, and comment on it! Also, keep in mind it's my very first video. I am well aware that the editing is a bit rough. Practice makes perfect, so the more videos I make, the better they'll be, and I plan on making many more of these videos. Common Names- Ordinary violet, Common blue violet, Sweet violet, Garden violet, Common violet, Chinese violet, and other common names throughout the world. Parts Used- All parts of this herb are used in various ways, however the most commonly used parts are the flowers and leaves. The roots tend to cause nausea and vomiting, so they are used in selective preparations. Parts Eaten- Eat the aerial parts of the plant, the flowers and leaves, raw or cooked. The roots of most species can cause nausea and vomiting so it's best to avoid those. Violet is often used used to decorate cakes, salads, poultry, and fish. Candied violets are preserved with a coating of egg white and crystallized sugar. General Benefits and Energetics- Violets are cooling and moist. They nourish and uplift our bodies and our spirits. However, they're not a nervine, nor are they antidepressant. They help to calm people who tend to be slightly “hotheaded,” especially if you notice an outburst looming. Violet tends to soften and bring about more flexibility in those who tend to be rigid, especially in their reaction to stress. Due to it's nourishing nature, the best way to gain it's benefits are by eating this lovely plant. The flowers make for a beautiful addition to any salad, cookie, cake, or even frozen in ice cubes. The leaves make a great, nutrient rich, thickener for soups and sauces. Put the flowers and leaves in water and allow to sit in the sun for a while, this makes a great sipping tea. Drying the leaves and making an overnight infusion is also a great way to get all the nutrients this little plant has to offer, this is especially great when you combine Violets with Nettles. Flower Essence- The essence of Violet helps to open people up, this is especially useful for shy people who are searching for a new job, or anyone who is looking to start a new friendship. It also helps to calm down heat centered personalities. Helping hot headed people to maintain an even keel. Traditional Chinese Medicine (TCM)- Known as Zi Hua di Ding in Chinese Medicine, Violet/Pansy works on the Heart and Liver Meridians. It's spicy, bitter, and cold properties are used to clear heat, remove toxins, and resolve masses. It's helpful in treating boils and carbuncles. It's also used to treat snake bites and inflammation. It's used in conjunction with dandelion to eliminate toxicity and is used to help treat cold deficient conditions. Lymphatic System and Cancer- This herb is considered a great lymphatic stimulant. It helps to move the lymph, unclog blocked lymph nodes, and over time it can also clear up some of the more stubborn problems associated with slow or static lymph. This also helps to shrink tumors and clear up certain types of cancer before they can take hold and cause health problems. Dry Skin, Wounds, and Insect Bites- Violet's mucilage content helps to soothe sore, inflamed skin. This makes it great for eczema, psoriasis, and other skin conditions. However it also works well to speed the healing of wounds and insect bites. It's also known to help bring boils to a head and to aid in their draining, helping to speed their healing. Circulatory System, Varicose Veins, and Hemorrhoids- Violet is considered to be a blood cleanser and circulatory tonic, but it''s anti-inflammatory actions work especially well on varicose veins and hemorrhoids. It works really well as a poultice for this action. 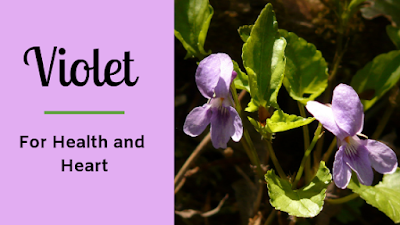 Digestion- Violet is one of many plants that contain a slimy substance that we commonly refer to as Mucilage. Mucilage is a great aid to digestion as it lubricates the entire GI tract, and I do mean the ENTIRE tract. It helps soothe any irritation and helps to move your food through the digestive processes, especially in cases of constipation. It really does aid just about everything from your mouth through to your bum. Breast Health- Violet helps to clear up growths in the lymphatic tissues that make up our breasts. It helps to reduce the size of the growths and to clear up lumps, cysts, mastitis, plugged milk ducts, and fibrocystic breasts. In this case, violet is especially potent in the form of an infused oil. Just use the oil externally, as a massage oil, and give yourself a good breast massage. The action of the massage will help move congested lymph fluids and the violet will boost this action. Headaches- Violet is a mild analgesic, which means that it does have some pain relieving properties. However, there are much better herbal analgesics out there, so it's not the first plant I'd call on for a headache or any other pain. However, it can be super helpful, especially in cases where your headache is caused more from dehydration (as is a large percentage of headaches), just add a bit of violet to your water, or make a quick tea, and drink away the pain. Contraindications and Warnings- Consuming the root of a violet may cause nausea and vomiting. I only included a basic introduction to this amazing and beautiful little herb. If you have any questions or comments, please leave them below.